Miami Trace senior Jared Fenner (at right) drives into his opponent, sophomore Tyler Stein of Canfield, during a 195-pound match in Division II at the first day of the 80th annual State wrestling tournament Thursday, March 9, 2017 at The Ohio State University. Fenner rallied from behind to win the match, 11-10 to advance to the championship quarterfinals Friday at 10:35 a.m. 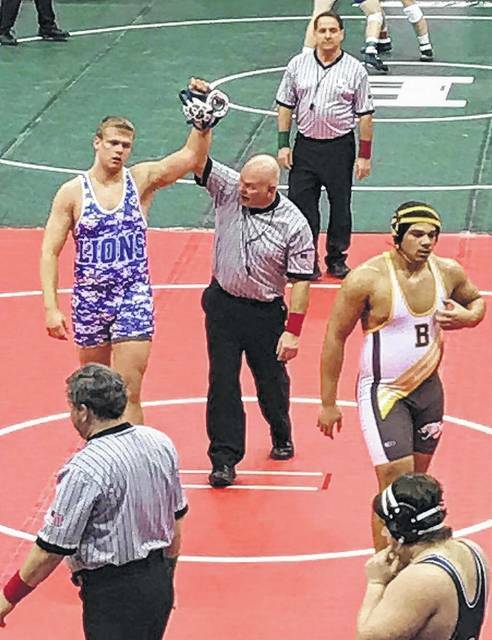 The official raises the arm of Washington Blue Lion senior Trevor Hicks after he pinned Aarin Smoot-Baker of Columbus Beechcroft (at right) in 1:46 in a heavyweight bout during the opening round of the Division II State tournament at the Jerome Schottenstein Center on the campus of The Ohio State University Thursday, March, 9, 2017. Hicks is now 51-2 on the season with a match Friday morning. Miami Trace junior Coby Hughes (at right) faces off against senior Austin Wolcott of Thornville Sheridan in the first round of consolation matches at 132 pounds Thursday night, March 9, 2017 at the Jerome Schottenstein Center on the campus of The Ohio State University. Hughes stayed alive in the State tournament with a 10-2 win over Wolcott. COLUMBUS — The 80th annual State wrestling individual tournament got underway on a beautiful late winter afternoon at the Jerome Schottenstein Center on the campus of The Ohio State University Thursday. The same three student-athletes who competed here last year made their way back through the Sectional and District tournaments to compete here in 2017. Miami Trace sent two wrestlers to the State: junior Coby Hughes at 132 pounds and senior Jared Fenner at 195 pounds. From Washington High School, senior Trevor Hicks competed at heavyweight. All three of these athletes went 0-2 at the State in 2016. First up, on mat 8 was Hughes (36-9), taking on senior LeConte Merrell (42-2) of Mansfield Madison Comprehensive. Hughes lost this match, 6-0. He would have to wait until 8 p.m. Thursday for his first round consolation match. “Coby got in on a couple of good shots,” Miami Trace head coach Ben Fondale said. “He just didn’t quite finish. The kid he wrestled placed seventh here last year. He’s a good kid. Every kid up here is good. “We just have to finish our shots quicker,” coach Jacob Garringer said. “That kid was a little unorthodox. He was just a good kid. I thought Coby wrestled him tough. He came out and took some shots and did some things right. Next, it was Jared Fenner’s turn to take the mat. 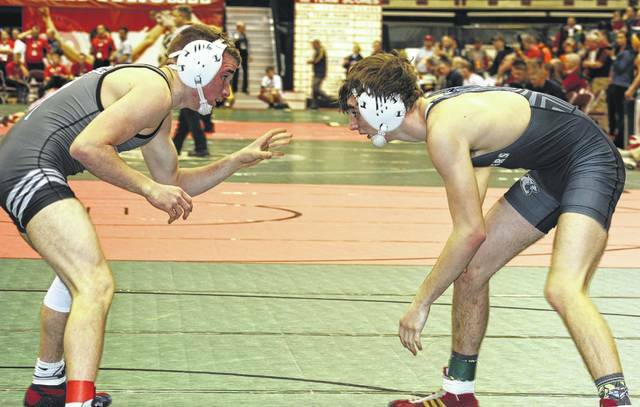 Fenner, 45-8 coming into State, was pitted against sophomore Tyler Stine (35-9) of Canfield. This match was full of action, from both opponents. Fenner had to come from behind, but he received a point late when Stine was called for stalling and soon had a take-down to come away with an 11-10 victory. Fenner (now 46-8) will wrestle Friday morning in the championship quarterfinals against senior Tony Banister of Wauseon, now with a record of 41-7 after a pin of senior Alex Eckels of Granville. “One thing Jared prides himself on is his conditioning and his mental toughness,” Fondale said. “He was down three points going into the third period. He continued to put pressure on the kid and continued to work hard for his moves and to keep his offense running. “What you just saw was, the kid was just tired,” Fondale said. “And Jared was not tired. When there is two minutes left and one kid is tired and the other is not tired, the other guy is going to score a lot of points. “Starting off the first period, it was looking rough, to be honest with you,” Garringer said. “He took us down three times. It wasn’t looking good. Then, you could start to see the kid wear down. Fenner just stayed on his head. The kid just flat-out broke. Trevor Hicks had one of the last matches of the opening round in Division II at 285. His opponent: senior Aaron Smoot-Baker of Columbus Beechcroft. Hicks went after his opponent with utmost determination and pinned him in 1:46. Hicks improves to 51-2 and will have his next match Friday morning against Mason Giordano of Canfield who is now 35-8 after a 13-4 major decision over junior Demarko Craig of Toledo Central Catholic. “Trevor came out this year and he’s been more focused,” Washington head coach Louis Reid said. “Last year, he was really happy to be here. He came ready to wrestle and looking for a win last year. I think it being his first time here really got to him a little bit. “This year, he’s been here already, he’s wrestled some big matches all season long,” Reid said. “He just had a different focus. From the time we arrived for weigh-ins, to even right as the match started; he knew what he needed to do. “I definitely was a lot more focused this time coming in than I was last year,” Hicks said. “I knew what it was going to be like walking out of the tunnel, so many people in the stands. It was definitely a lot better experience. I felt much more calm and relaxed when I walked out. “I just went right to it and got him on his back,” Hicks said. “He was a real strong kid. That’s what you’re going to see at this competition. I knew I had to go out there and do what I do. “I thought he went out and did what he had to do,” Washington coach Marlin Ellis said. “He got to it right away. He wrestled to his style and didn’t wrestle outside of himself. He did what he’s been doing all year. When the eight o’clock hour rolled around, it was time for the first round of consolation matches in Division II. 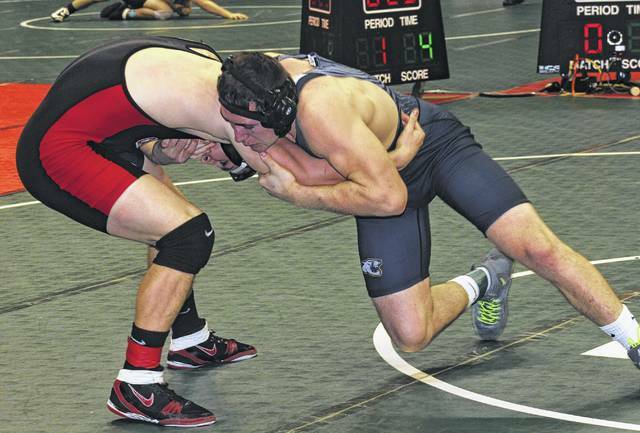 It was time for Coby Hughes to hit the mats again, facing senior Austin Wolcott (44-6) from Thornville Sheridan. Things turned out much differently for Hughes as he battled his way to a 10-2 major decision victory. Hughes will now wrestle Friday at 12:50 p.m. in the second consolation round. His likely opponent would be senior Chandler Golec (26-8) of Uhrichsiville Claymont. Golec has to face two-time defending State champion, junior Mitch Moore (35-1) of St. Paris Graham in his next match. “It’s always a great thing when you get that first win out of the way,” Fondale said. “We knew we were going up against a pretty strong kid. Our goal was to stay out of the tie-up and work ankle picks. Coby got three take-downs with it. That kid really didn’t come close to scoring. Hughes used the time after his first match to contemplate his second test. Asked what the feeling was like, Hughes took it almost in stride. “I thought he looked good, just like in the first match,” Garringer said. “He was still hitting a bunch of shots. That kid really didn’t do much. We got where we needed to be and just wrestled smart from there. It was 6-1 going into the third period, so, you’re in a good spot. Just don’t do anything stupid and you should win the match. “I think that was the best I’ve seen him wrestle in a while,” Garringer said.